Focus on brunch or lunch and a round of golf at one of the area's classiest resorts. : Palm Coast, the boom town north of Daytona Beach, has an explosion of restaurants and this one is a sunlit standout. One entire, windowed wall overlooks the Atlantic. Dinners are elegant with candle-glow and the glint of crystal, but it's a shame to miss the view during daylight hours, especially at Sunday brunch. 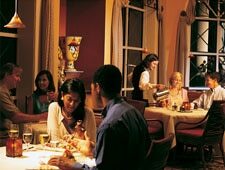 Inventive cuisine accents the light and lively, such as lunchtime's Buffalo po' boy made with rock shrimp and olive salsa, and dinnertime's grouper in lobster broth, plantation-smoked shrimp and the filet mignon. Specialties include she-crab soup and a house salad made with oranges and Champagne.